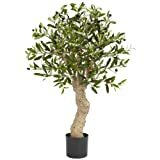 Olive tree for sale is ideal to be purchased and planted in the spring when the frost has passed. These are bare root trees grown in the nursery. Although olive trees can be grown in a range of climates they produce best with a long, hot, dry summer to ripen the fruit, and cool winters. Most home growers of olive trees use the fruits for to make pickles out of it. 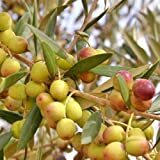 It is not advisable to grow olive trees for the oil as the machinery needed to press the olives is expensive and needs a huge amount of crops to produce oil. A 5 kilogram of olive fruits will produce a liter of olive oil. Location – Choose a site that receives full sun or at least 6 hours of direct sun per day. Avoid areas where water stands during rainy periods or where ground water seeps into a hole 2 feet deep. Soil – Plant your olive tree in your native soil. Olives like light, free-drained soils. A pH of 6.5 to 7 is preferred. Do not amend the soil with organic material, moisture-retaining polymers, fertilizers or anything else. Staking may be required at the time of planting. 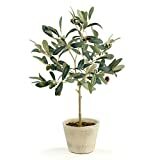 Planting – Before planting, your olive tree should be well-watered. Place the tree in the hole slightly higher than ground level and place about one inch of soil from the surrounding area on top of the root ball. Mulch – Avoid using wood chips as mulch to your olive tree. This is high in carbon and robs the soil of nitrogen in its decomposition process. Use pine straw, pine bark or gravel instead and keep it back several inches from the trunk. Water – Begin irrigating the trees as soon as the soil becomes slightly dry. Insufficient water will cause your olive tree to suffer and even die if left too dry for an extended period of time. If you planted on sandy soil, you should water your tree more often. Once established, olive trees are among the most drought-resistant trees in the world. Fertilization – Feed your plant with fertilizer after planting and regularly throughout its growing season. Use a fertilizer that has a nitrogen analysis of at least 10 percent. Be sure to water very well after application. Avoid placing fertilizer near the trunk of the tree. It is recommended to feed lightly and often during the growing season. Avoid heavy applications of fast release fertilizer that could damage plants and leach or run-off into groundwater. Pruning – Generally, olive trees so not require pruning in order to produce fruits. But it may be helpful to prune the top upwardly growing branches back by a few inches to encourage lateral growth. Pruning to achieve a desired shape is also acceptable. You may also prune to have an open centre that will also help to increase airflow, thereby reducing the disease building up in dense branches and foliage.